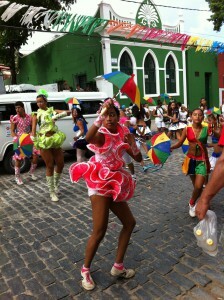 The Olinda Carnival together with the Carnival in Recife is where Brazilians from all over the country come and party. The Unesco World Heritage listed old town of Olinda makes a perfect setting for a street party that lasts for a week, or even more. People start preparing for the Carnival soon after Christmas since they just can’t wait. 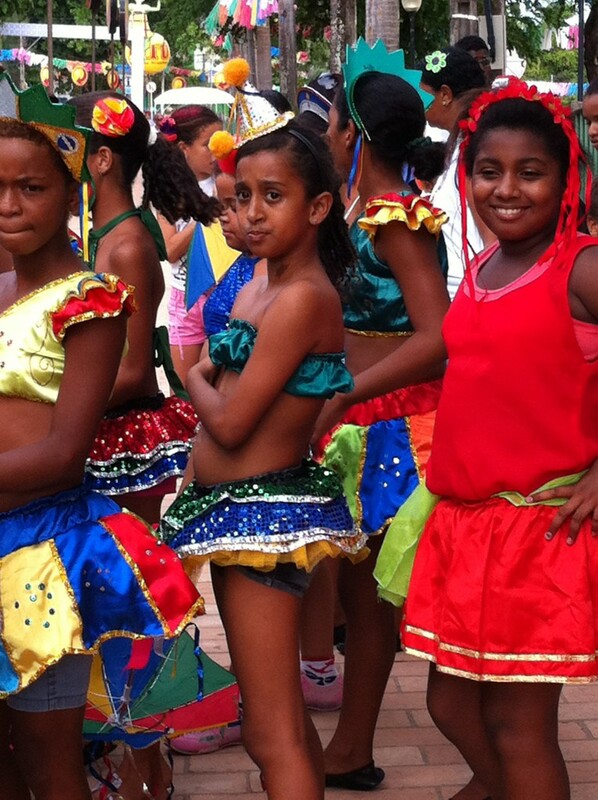 We wanted to get a feeling of Carnival preparations in Olinda and went there a few days before the start, to see that the party was going on already. Later we spent a Carnival day in Olinda and enjoyed the party and the parades. 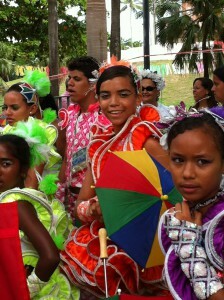 Later on the same day we headed to the neighbor city Recife and continued the party with them. 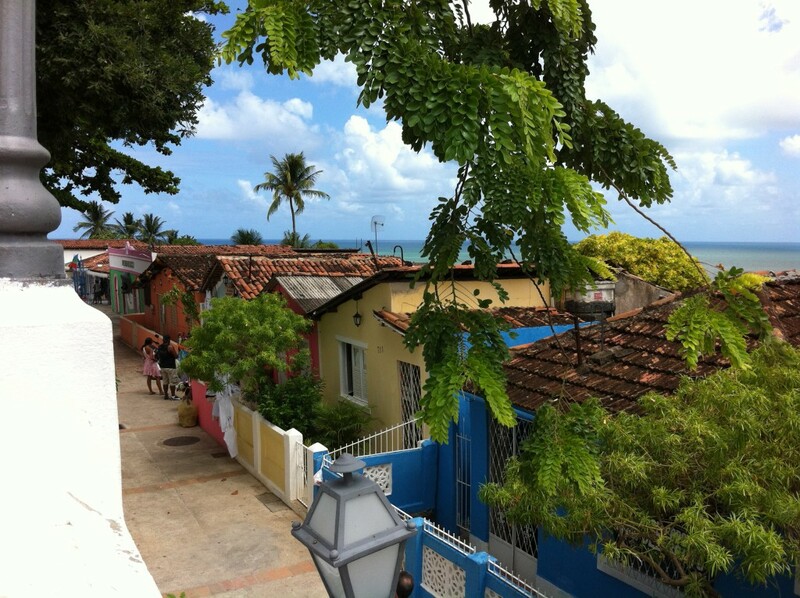 The city of Olinda has been given the right name: Olinda means beautiful. 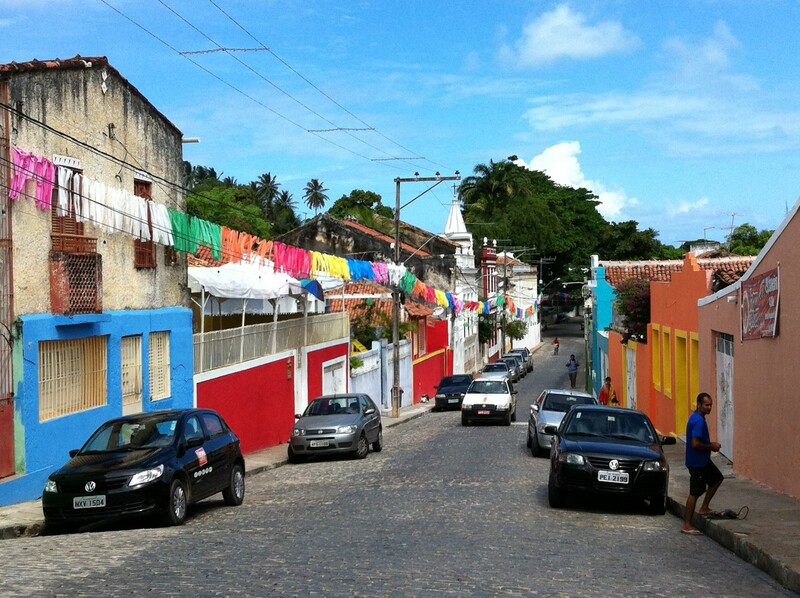 Olinda is a historic city that was founded in 1537 by the Portuguese. 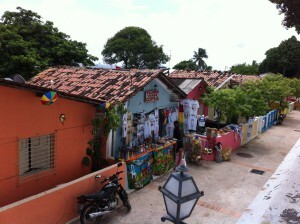 Today Olinda is like an open-air museum. 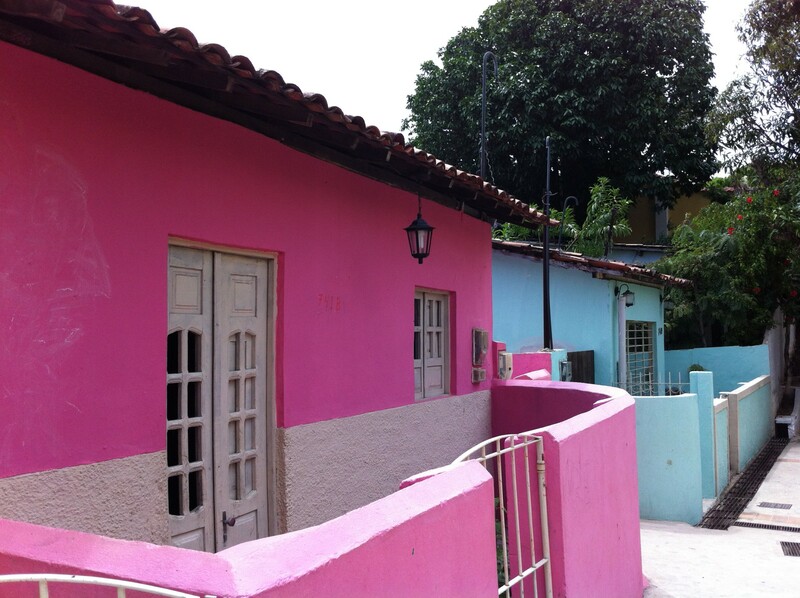 Olinda Old Town (Cidade Alta) is full of brightly coloured colonial homes. The atmosphere is relaxed and it’s a real pleasure to stroll along the twisting cobbled streets. 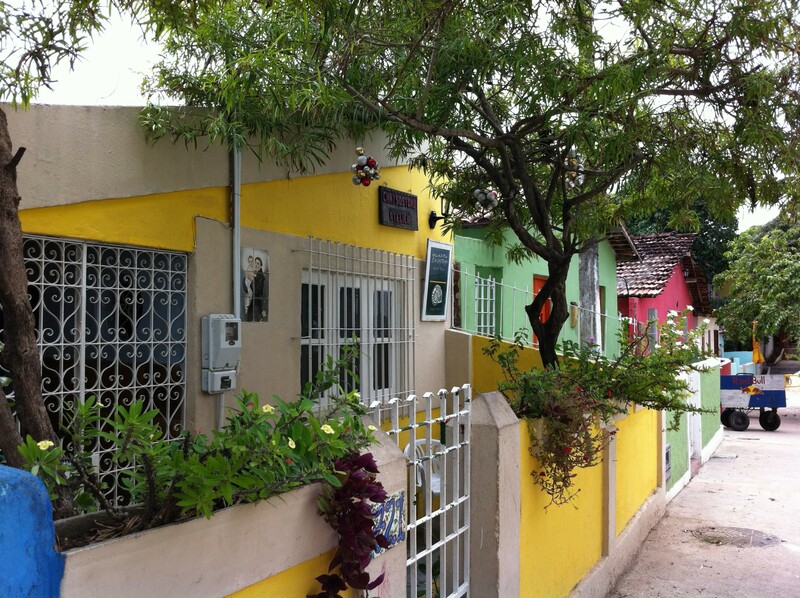 The place is very pretty, no wonder Olinda has by Unesco been declared a World Heritage Site. 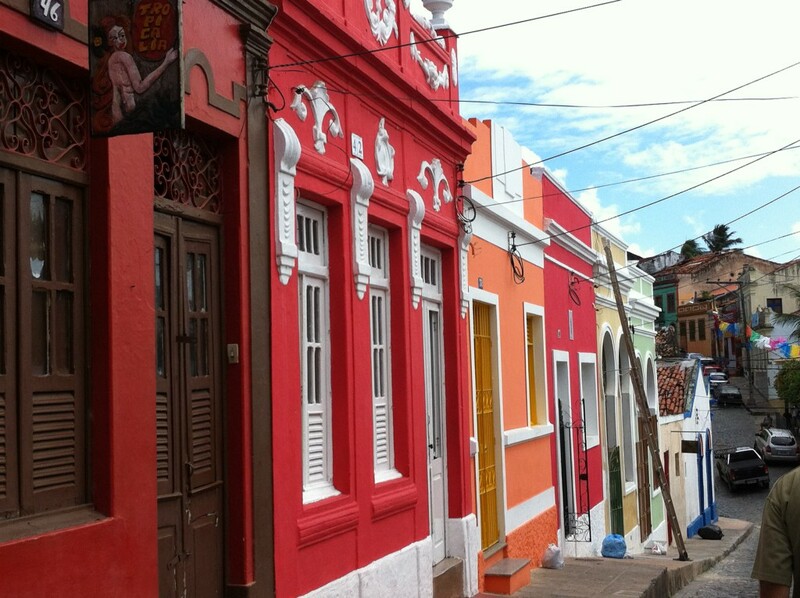 Olinda is famous for its colonial houses, pretty gardens and beautiful Baroque churches. 20 old Baroque churches and many more pretty chapels can be seen all around the old town. 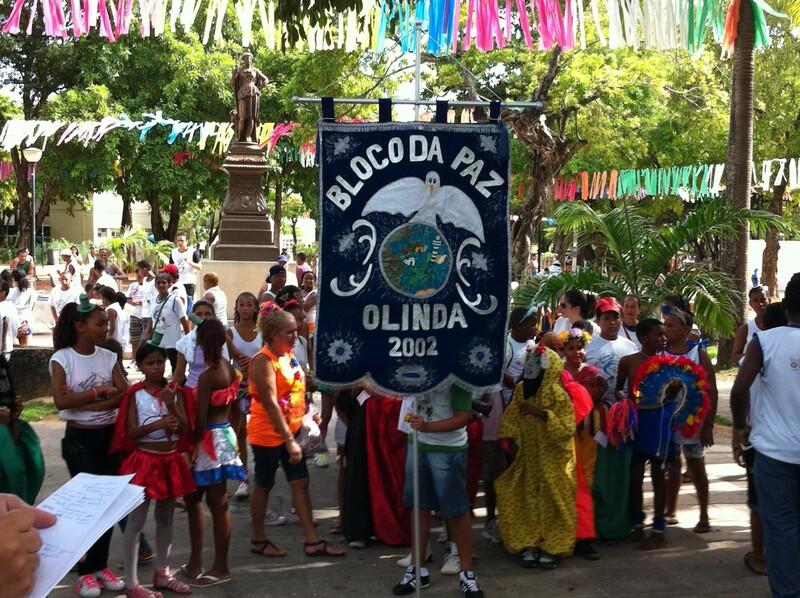 One more thing Olinda is famous for, at least in Brazil, is the Olinda Carnival. Olinda is located in the state of Pernambuco on the Atlantic coast of Brazil, only 6 km north of its neighbor city Recife. Together they make a twin city and both of them have famous Carnivals. The population of Olinda is 400 000 people. 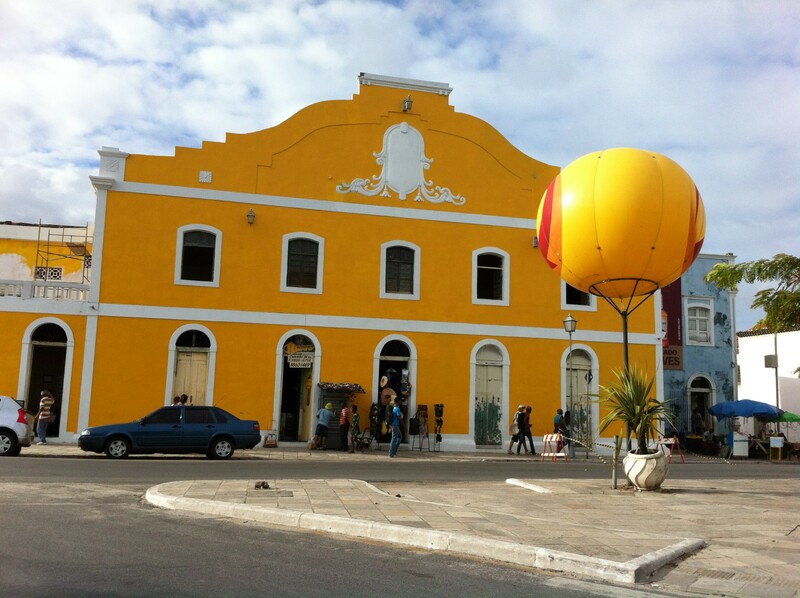 We were visiting Recife for business and two days before the Carnival there was a chance to take an afternoon off. 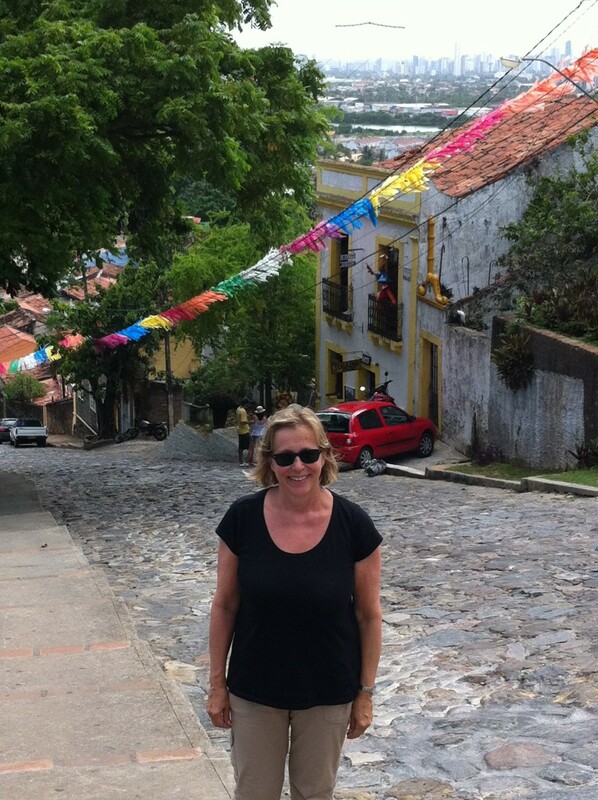 We took taxi to Olinda and spent a sunny afternoon in this pretty World Heritage city. The taxi brought us to the top of the tree-covered hill above the city which is part of the Old Town. There we got a gorgeous view of the city which was a perfect way to get oriented. We spent some time in one of the sidewalk cafes and admired Carnival decorations that were already there waiting for the party. We walked down the hill to the lower part of the Old Town. The best way to explore Olinda is on foot. 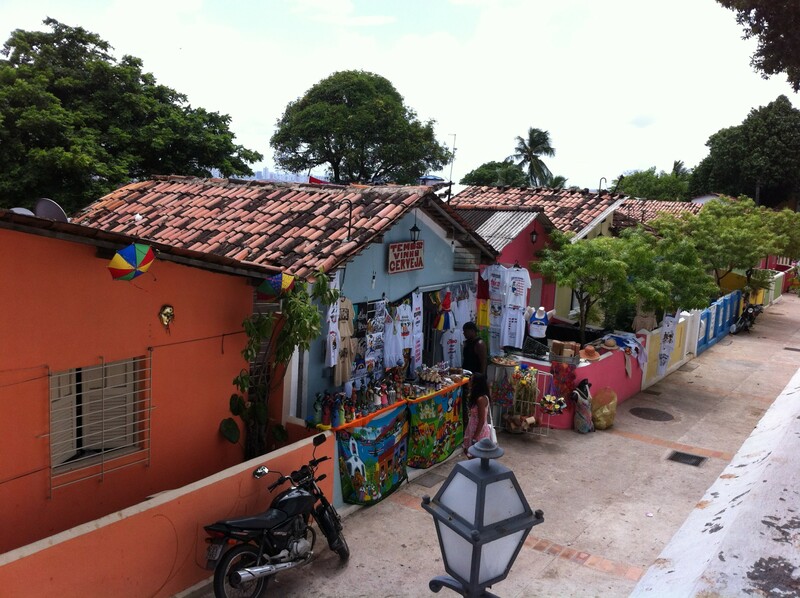 Here are some street views of Olinda Old Town. Most of the houses have been restored in the original style. Although the city in itself is much older most of the houses date from the 18th century and after. Much of the city was destroyed by the Dutch in the 17th century and rebuilt again. So it has not always been as peaceful here as on this day just before the Carnival. 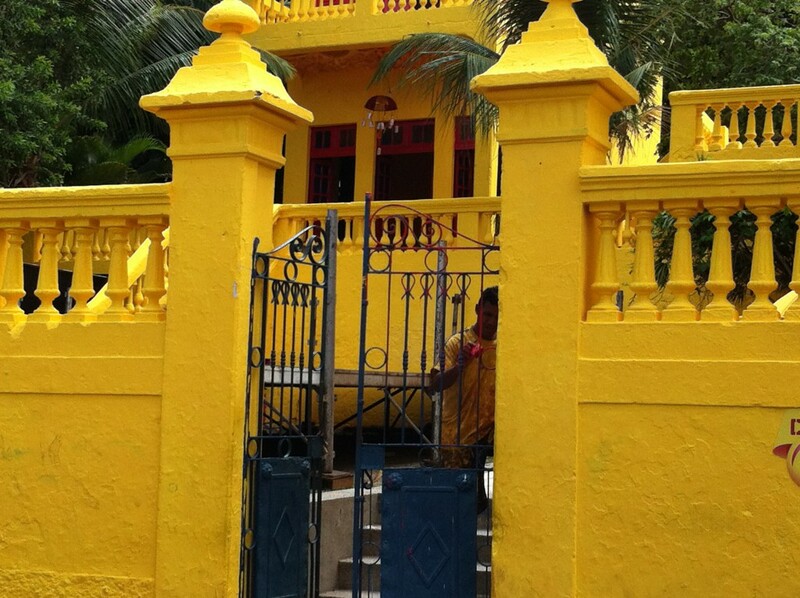 This man is painting his house and gate bright yellow for the Carnival. He was not the only person at work we saw. Everybody seemed to be preparing their houses for the big day. 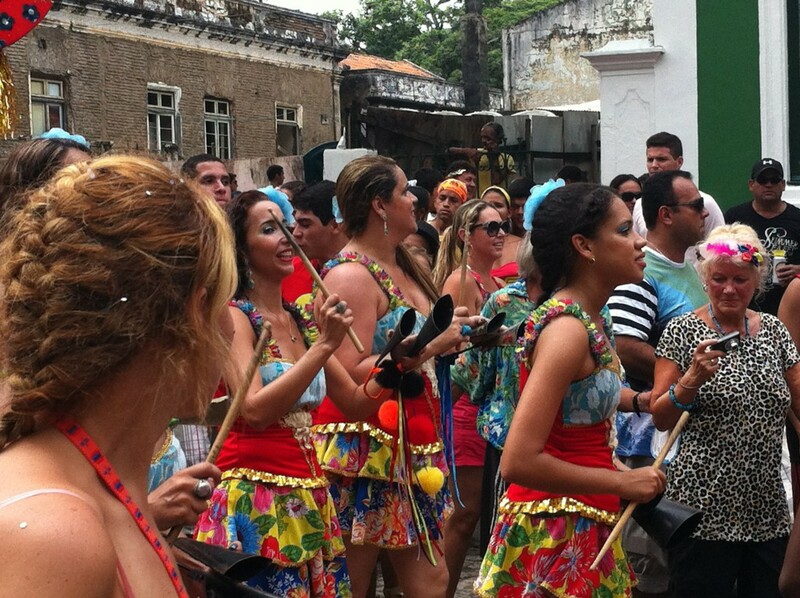 After Rio de Janeiro and Salvador, Olinda has the third most attended carnival in Brazil. 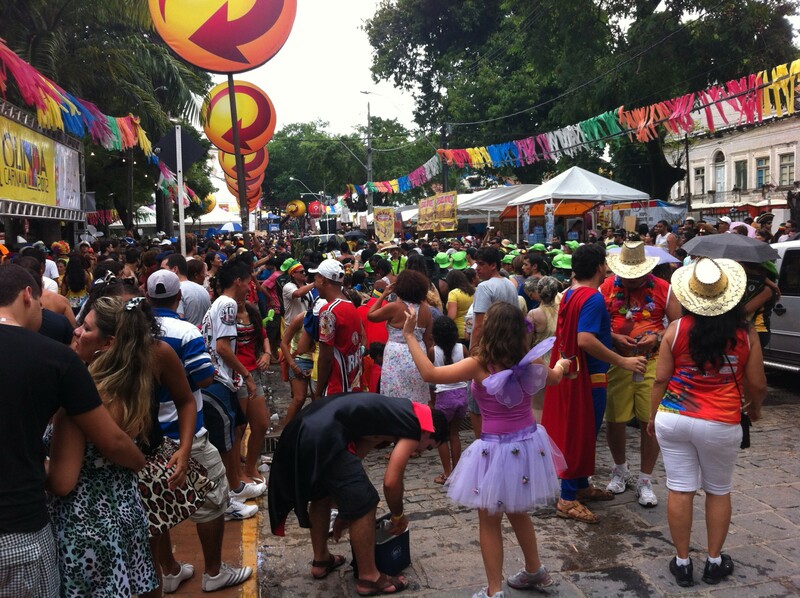 More than 2 million people visit the Olinda Carnival every year. And still better, there are two different Carnivals, Olinda and Refice. 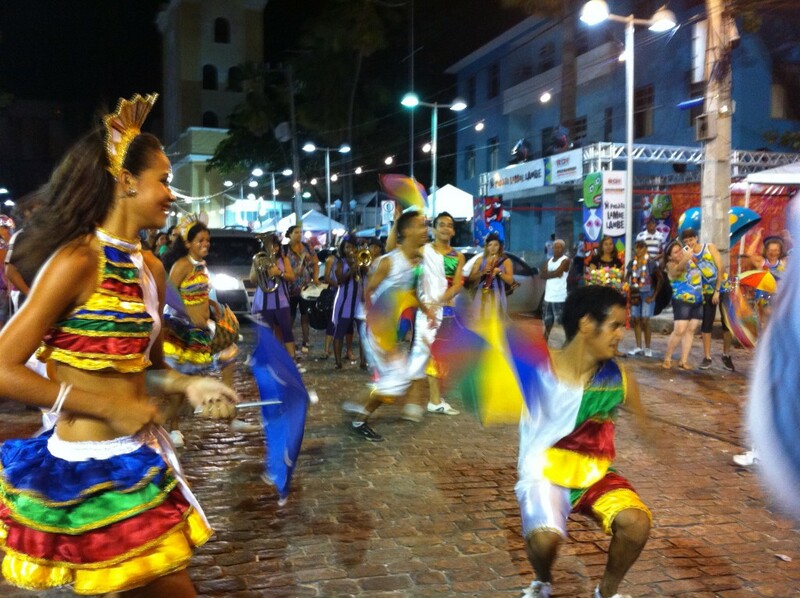 The sister city Recife also has a huge Carnival, also in the historic quarters of the city. 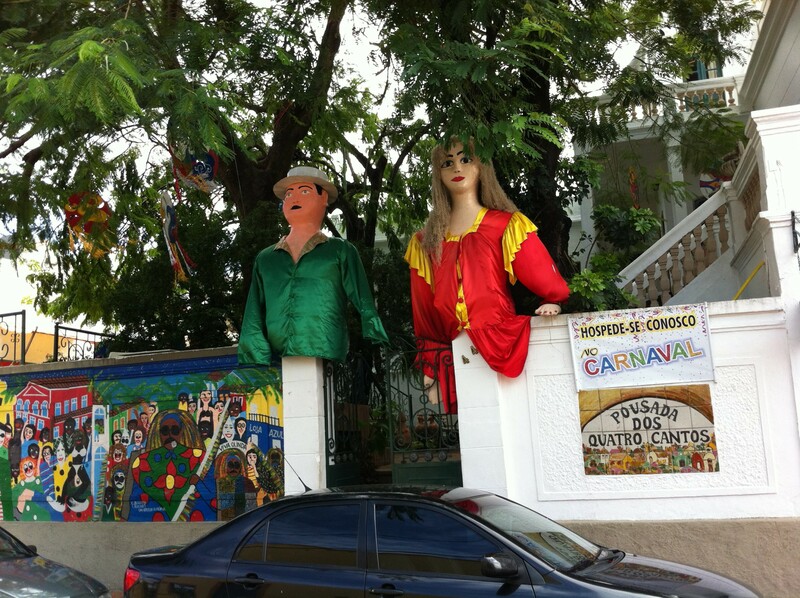 A specialty of the Olinda Carnival are this kind of giant puppets. 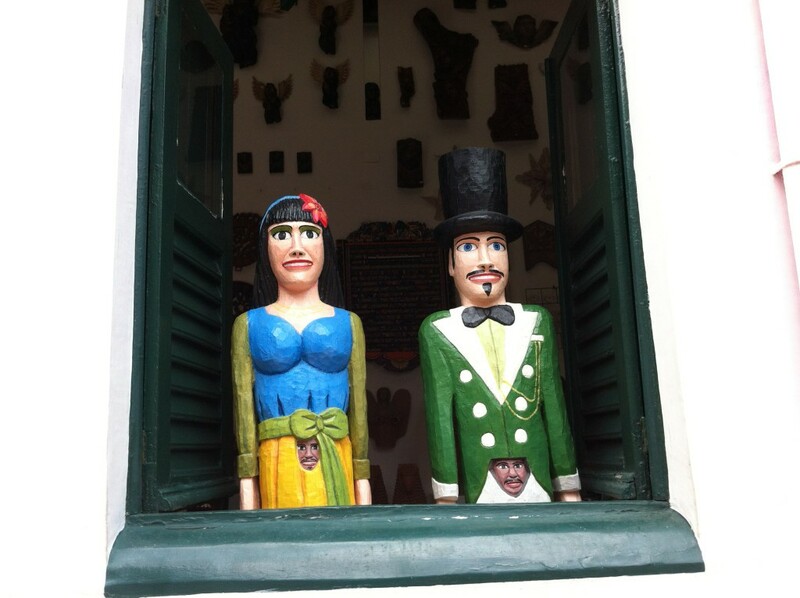 They are prepared by artists and you can see them everywhere in the old town. They sit in the windows, some of them are waving at you and others have occupied a house gate. 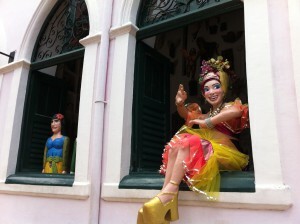 And much bigger puppets than these ones are used in parades. 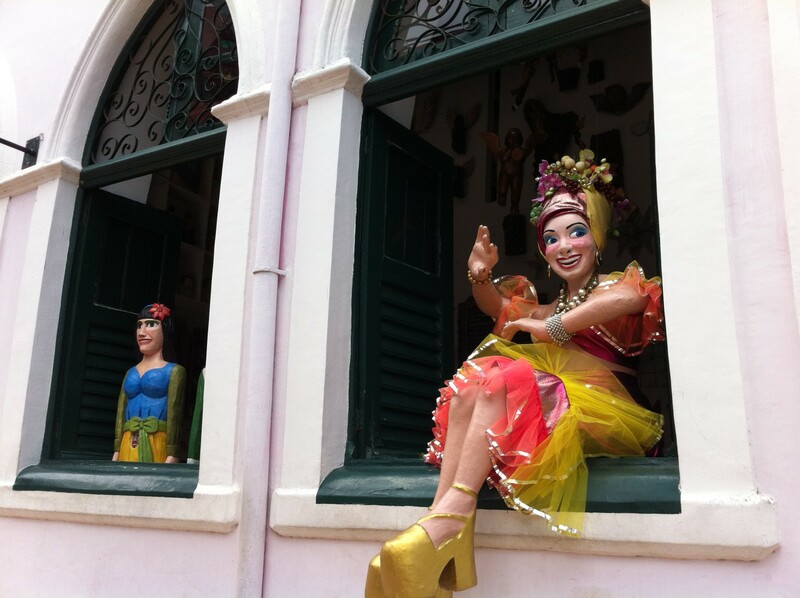 The carnivals of Olinda and Recife are said to be the most traditional in Brazil and this kind of puppets are one of the old traditions. This a simple eatery where lots of locals were having lunch so we decided to do the same thing. 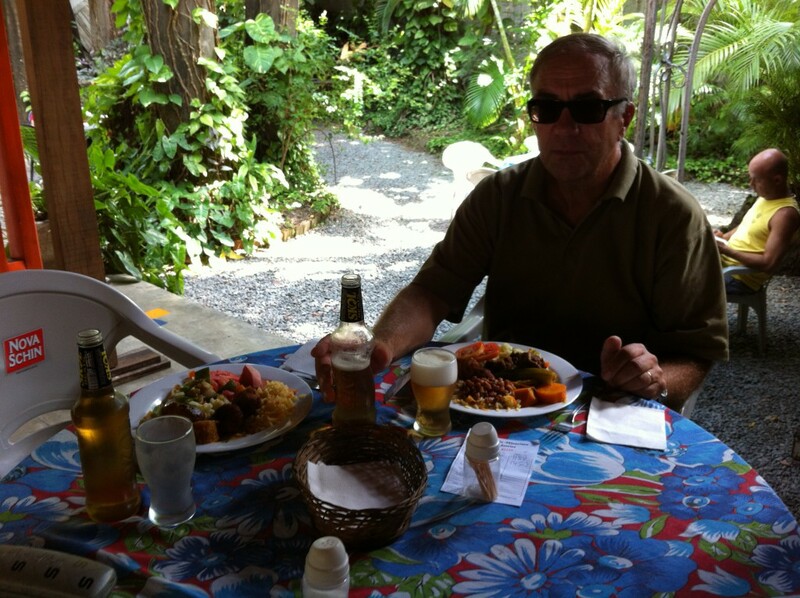 We enjoyed the lunch and the touch of local atmosphere in this garden restaurant – and the typical Brazilian music somebody was playing in the distance. Where did all that music come from? We walked towards it and came to a park where crowds of young boys and girls, probably school children where gathering. The boys and girls and their teachers were busy. They were all preparing for a parade through the city. And look at their clothes! You can tell they have put a lot of effort on their dress. 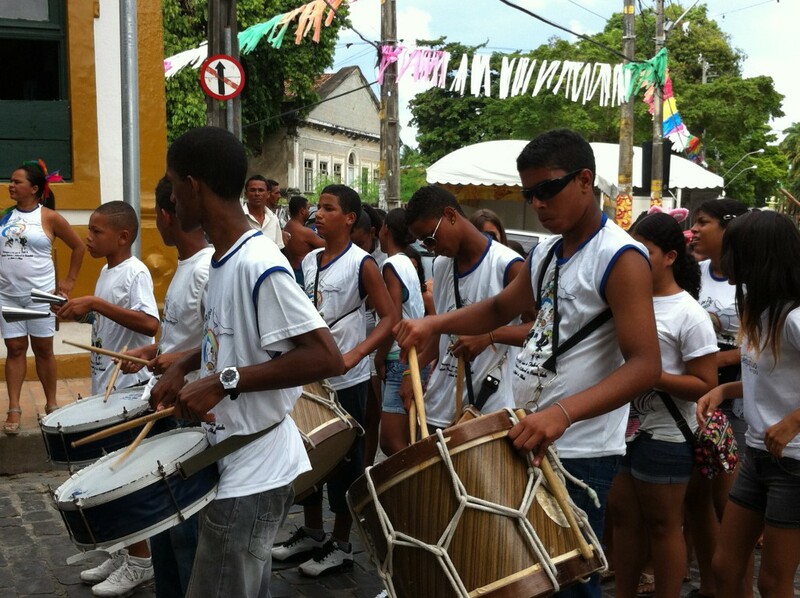 There was an orchestra that started playing very typical Brazilian music (frevo) and then the march began. 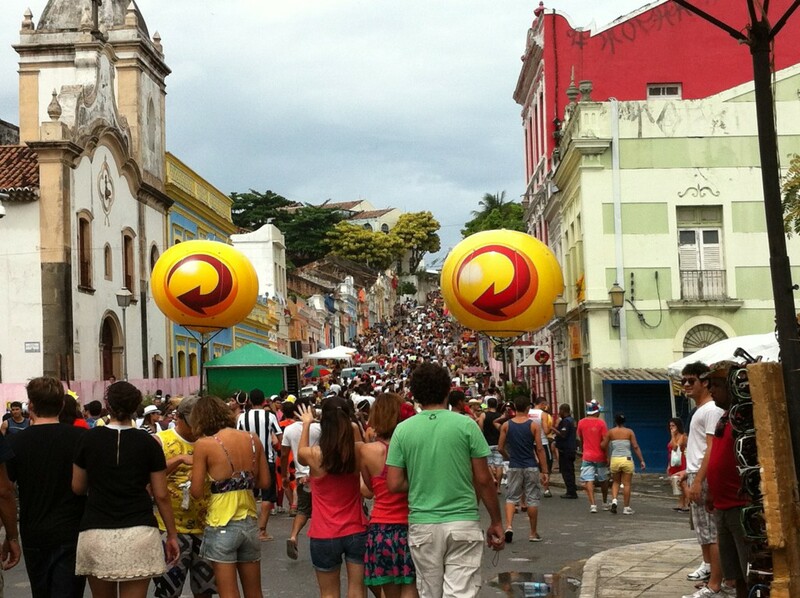 Brazilians say that Olinda gives you a real taste of carnival. Olinda Carnival is very different from the Carnival of Rio de Janeiro. 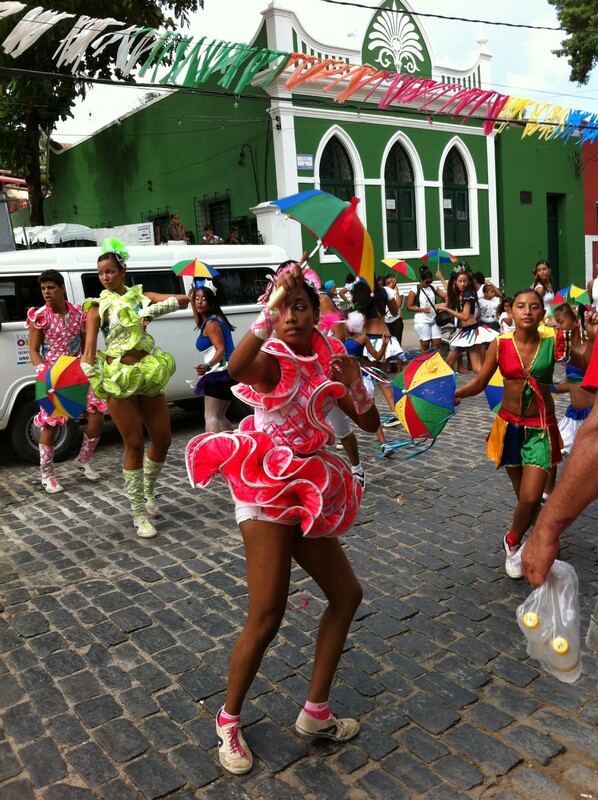 In Olinda (like in Recife) anybody who wants can participate in a parade, called bloco. 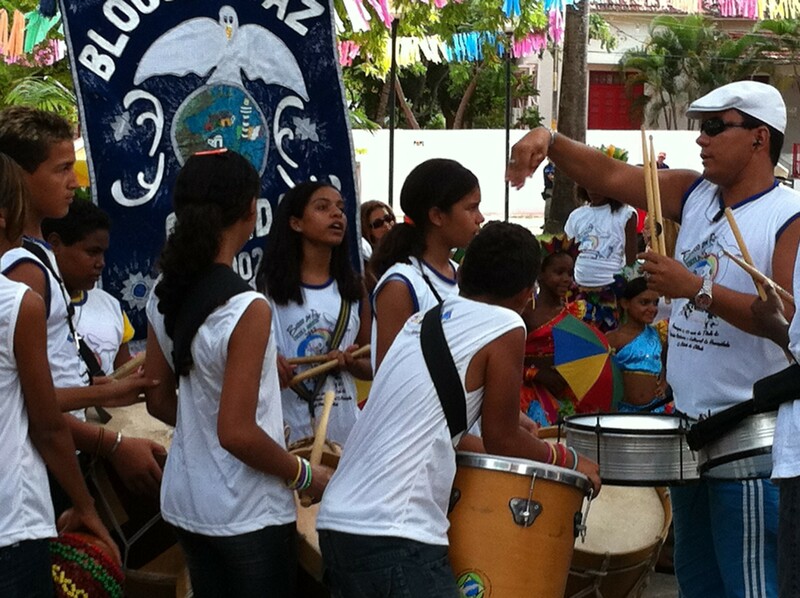 Blocos are spontaneously formed by groups of people that just want to march and dance together. So we were witnessing our first bloco, and it was a school bloco! This is how life should be. 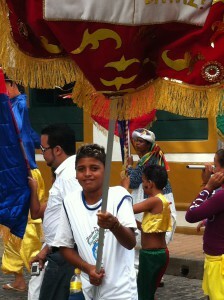 Children learn and keep the traditions of the country. There was so much speed, joy and excitement in the children and in all the family members and locals that followed them through the Old Town of Olinda. 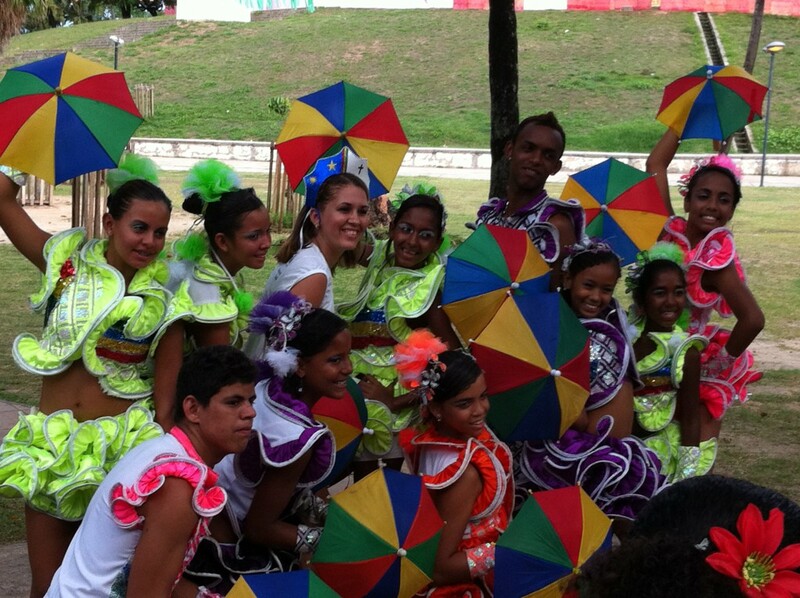 The dancers were waving their umbrellas with brass bands and drums following them. 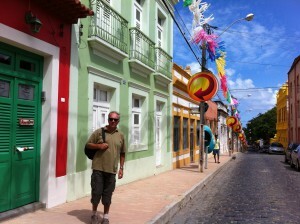 Many locals we talked to said that we should visit the Carnival in Olinda at daytime and then go to Recife at night. We followed their advice. 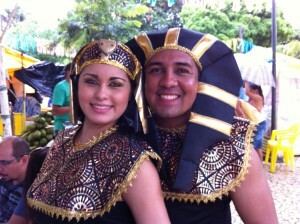 We came back to Olinda on the first day of the Carnival which was the Carnival Friday. Already on that day all streets were packed with people. The party was to go on for 6 days, until Ash Wednesday. 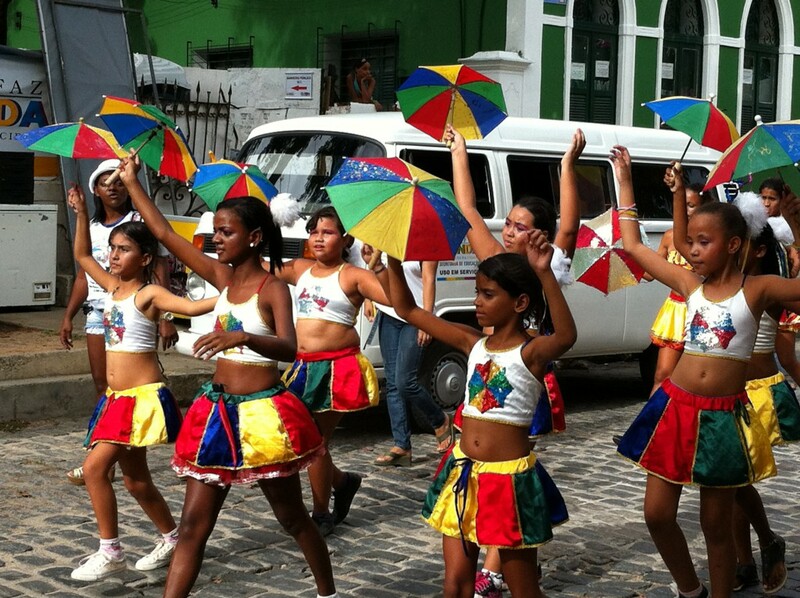 During the 6 days of Olinda Carnival there are hundreds of groups performing and you can see musical groups and dance shows everywhere in the old town. You can also see lots of spontaneous blocos. In Olinda you don’t pay for entrance. Everything happens in the streets right where the people are. Some people dress up and some wear their normal clothes but everybody seems to have fun. During these days I realized that to understand Brazil you have see the Carnival. 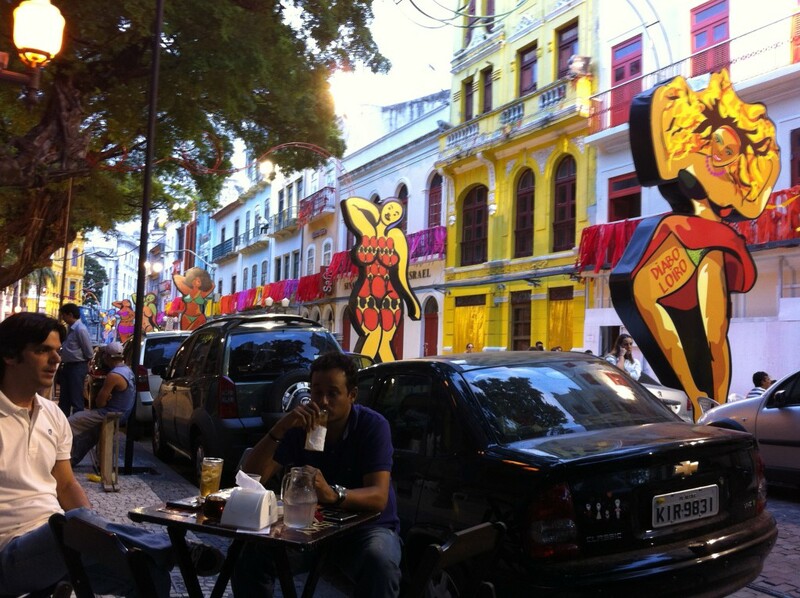 What you should know is that Olinda streets get even more packed towards the night and people get wilder. Crowds of people are coming and going and you have to keep your money and cell phone safe. We didn’t bring our camera at all and took all our photos with a cell phone. We had our money and valuables in our travel money belts. 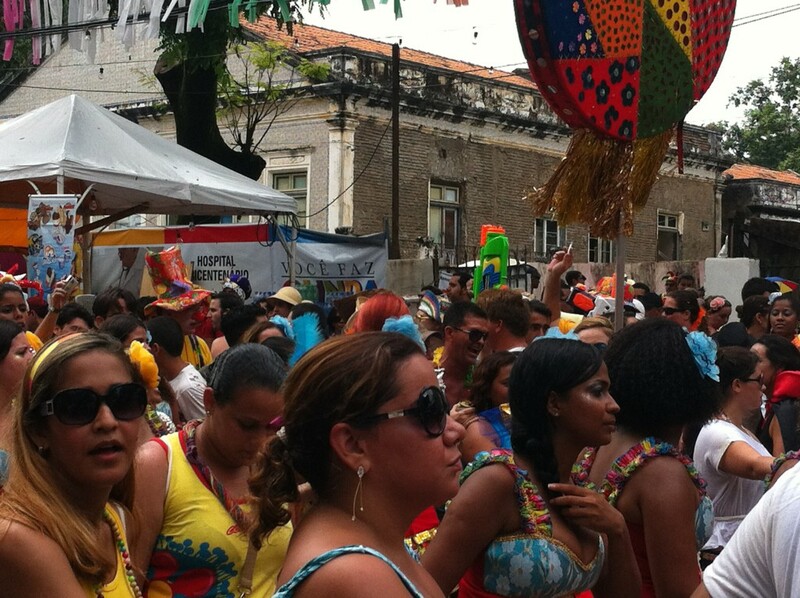 Later in the afternoon we left Olinda to see what the Carnival of Recife is like. 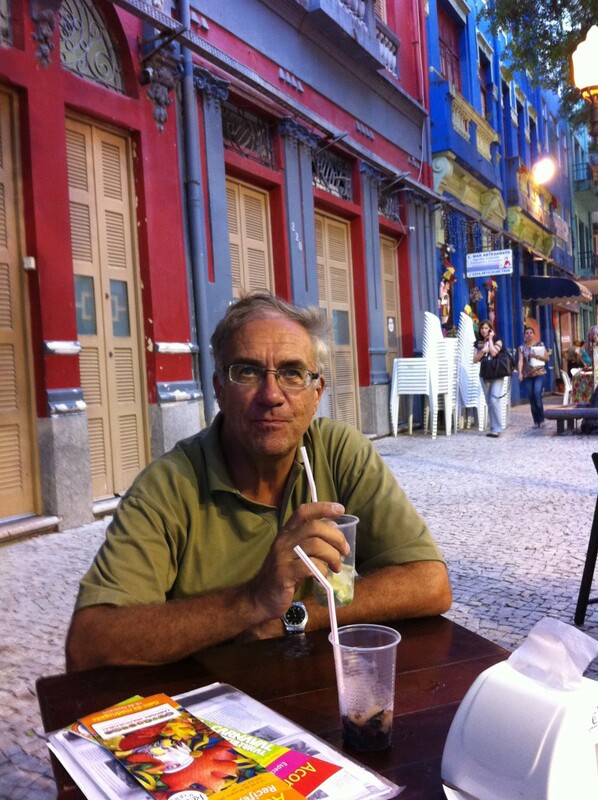 It was a huge effort to get a taxi since everybody was going to Recife at the same time. We spent the rest of the day in the quarters of the Old Recife, Recife Antigo. That is the place where most people go. Like many others we took seats in a street cafe in the old town. 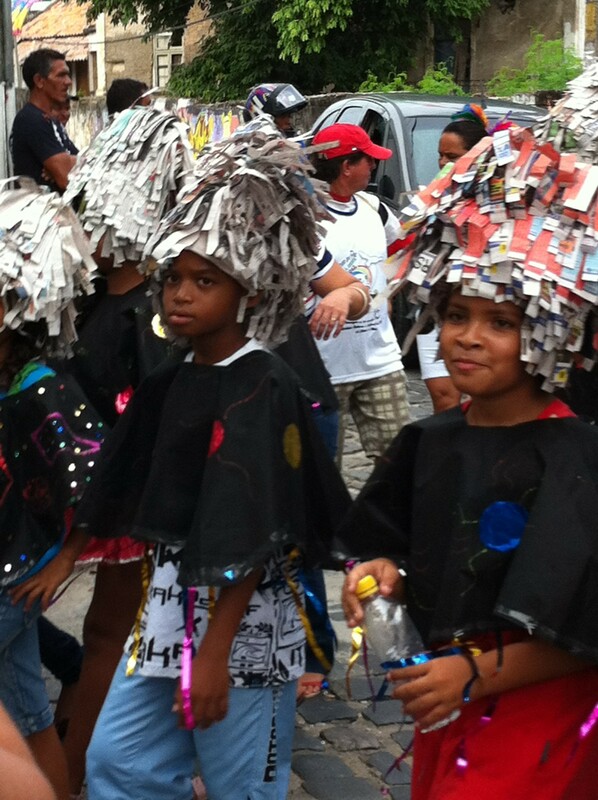 We chose one of the smaller side streets along which all parades passed. That was a good idea. We saw the parades right in front of our table. We sat in this place for hours watching the great spectacle. Blocos with giant puppets followed each other and between them came spontaneous groups of women, men, both young and old children, parades of elderly people, all of them dancing to the music. 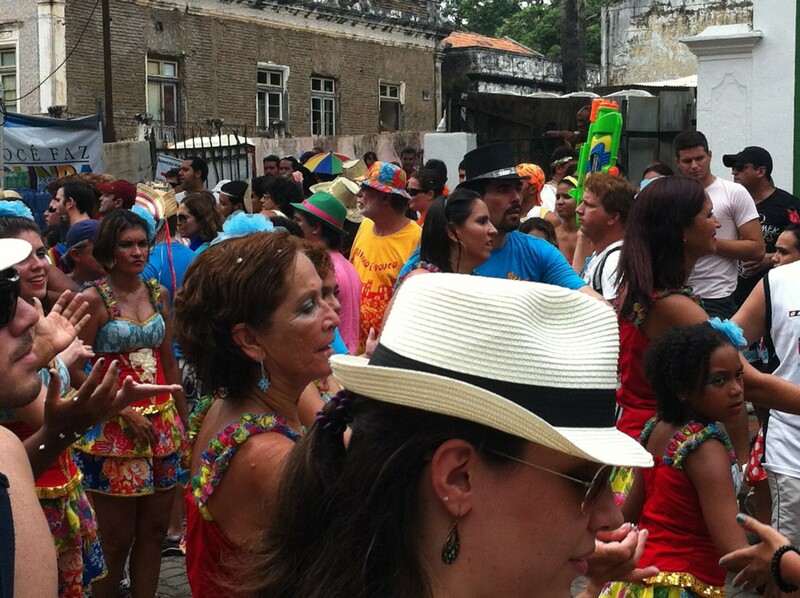 It’s true what they say about Recife and Olinda, anybody is free to join the party and have fun! There were concerts on different stages in the old town but there was no chance to get a seat again if you leave your table. The cafe surprised us. They kept bringing us delicious Brazilian snacks, meals and of course drinks during the whole night. That was a magic night I won’t forget and the whole day was a great experience. 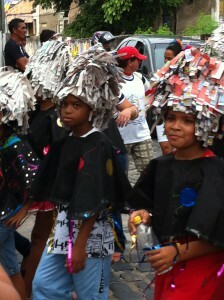 Also in Recife the Carnival goes on for days. 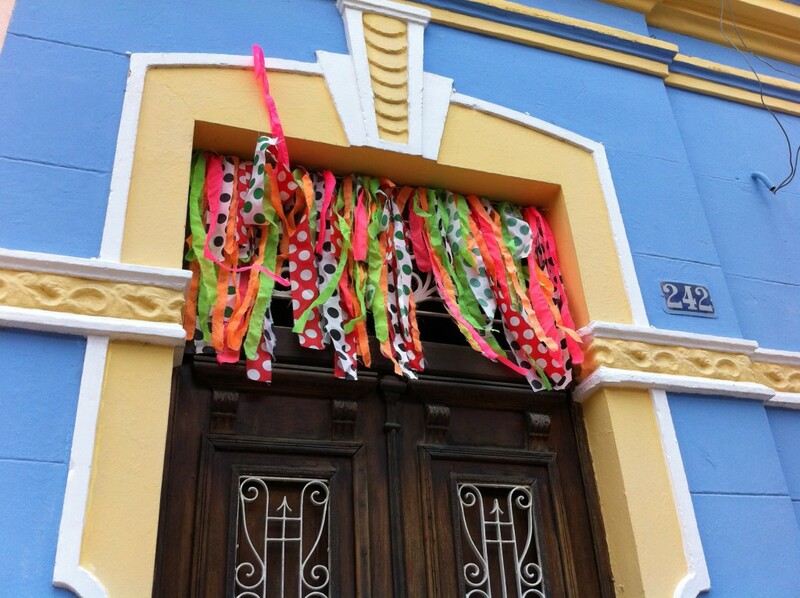 In fact the carnival begins soon after Christmas with preparations and pre-Carnival parties since people just can’t wait. They start looking for colorful clothes from their wardrobes and buy stuff to create new clothing. The official start is on Saturday Sábado de Zé Pereira. That morning there is the carnival parade Galo da Madrugada with a huge rooster. The Galo da Madrugada parade is according to the Guinness Book of World Records the biggest carnival parade in the world. 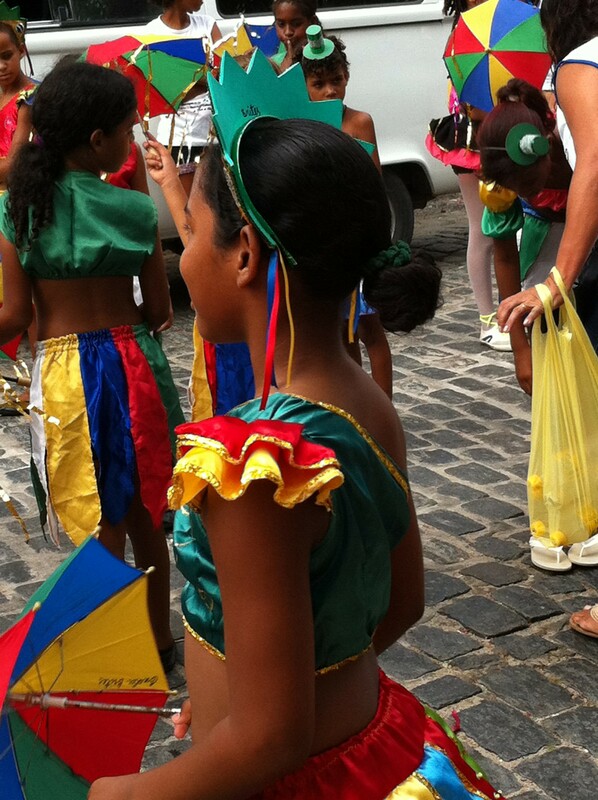 I’ll end this post on the Brazilian Carnival with this picture of happy street dancers in Recife Old Town Recife Antigo.